Well, it almost went undone, this year's blogathon. Then someone (Annie?) asked about it and the next thing we knew, Freelance Success decided to host it with a generous amount of backup support from Michelle Rafter. And we're off. I, for one, was definitely missing the idea of it. So here we are, I've barely blogged since the last blogathon, but I intend to try yet again to make this a better place to be, a better place to learn about food and just be inspired to eat well. And my overarching goal is to have this momentum carry over into the rest of the year so I come here to blog. I will add that in addition to this daily blogging, I have some other daily goals in my life. I've been trying to paint daily (mostly have succeeded, but this week have fallen woefully short), exercise an hour a day (yes, I blog that, too, but it's only an exercise log) AND I've been trying to learn french by doing one French lesson online daily at French, ETC. Of course this means I've given up about three hours of my day--well, maybe 2.5 hours--but that's okay, because I am pretty sure I was wasting that much time. Now I try not to waste time. So welcome to my blogathon 2014. Eat well this month! French lessons, too??? My word, when do you sleep? 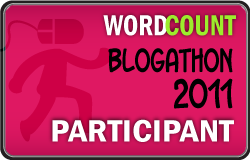 I'm exciting about starting this year's blogathon too, although your list of additional stuff is very impressive indeed! :-) Good luck with everything this month. Working on not wasting time (and filling that previously wasted time with worthwhile things) here, too. I remember you from last year's Blogathon...excited that we are doing it again! LOVE the idea of food watercolors...can't wait to see what you do!